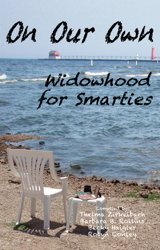 Widowhood…a status with some deference but a role few seek. A new beginning usually greeted with dread rather than anticipation. The writers of this collection express the range of emotions at the loss of a spouse but the overwhelming message is affirmation of the strength they find to create new lives after deep loss. Widows and widowers will read these stories and poems with knowing nods, sighs and smiles. Other readers will find insight into a common human condition and perhaps courage to face their own unsought new beginnings. As the subtitle suggests, this is widowhood for smarties, for those who acknowledge the pain of loss but who are learning to live in spite of it, even to build on it. Both men and women have contributed to On Our Own…essays, fiction, and poetry that explore the emotion and experience of losing a spouse. The writers include those who were married for fifty years or more, those who shared only a few months with a soul mate before being separated forever, and many in between. Anger, fear, sorrow, sweet and bittersweet memories, along with hope, appear again and again in these pages. The Silver Boomer Books partners were delighted to have this anthology proposed by Thelma Zirkelbach. They recruited Robyn Conley to round out the editorial team and it has been a delightful team effort. Thelma Zirkelbach was a romance author using the pen name Lorna Michaels until her husband’s death propelled her from the romance genre to creative nonfiction and poetry. She is a speech-language pathologist in private practice, working with young children who have speech, language and reading disabilities. 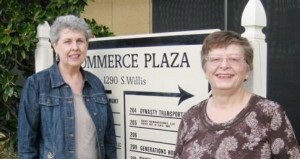 A voracious reader, she belongs to two book clubs, enjoys cooking, traveling and spending time with her grand­daughter. She lives in Houston with two cats to keep her company. Robyn Conley, the book doctor, speaks and writes about writing, editing, and marketing what you write. Her books include: Insights from the Jobsite published by Eagle Wings Press imprint of Silver Boomer Books; Be Your Own Book Doctor, which gives a checklist of editing tips for writers; and What Really Matters to Me, a journal that helps people discover their goals, and then offers practical tips to make those dreams come true. Her other published titles include a diversity of topics, such as Beyond the Branches, Writing and Scrapping Your Complete Family Tree and Pray the Bible with Paper and Pen. Her biographies include: John Grisham, Cartoonists, Alexander G. Bell, and the juvenile reference books: Meerkats; Depression; Motion Pictures; and The Automobile. Robyn has sold to major magazines, such as The Writer, Writer’s Digest, ABA: Student Lawyer, and a score of others. voices ringing out across the internet. Click the button below to order your copy of On Out Own for $14.00 US plus shipping costs and, in Texas, sales tax. Note to On Our Own Authors: Please email us at SilverBoomerBooks@gmail.com for your author rate if you wish to purchase more copies – and thanks!